Vegetated swales are an important Low Impact Development technique used to convey stormwater runoff. These open, shallow channels slow runoff, filter it, and promote infiltration into the ground; as a result, runoff volumes are smaller, peak discharge rates are lower, and runoff is cleaner. This approach contrasts with conventional stormwater strategies that rely on gutters and pipes that increase the velocity of runoff and do nothing for water quality. Swales are not just ditches under another name—they must be carefully designed and maintained to function properly. The vegetation in swales, usually thick grass, helps to trap pollutants (suspended solids and trace metals), and reduce the velocity of stormwater runoff; stormwater also percolates through the natural substrate. Vegetated swales can replace curb and gutter systems as well as storm sewers that convey runoff. Swales require more room than curb and gutter systems but they require less expensive hardscaping; furthermore, the reduction in discharge rate and volume means that downstream treatment facilities can be smaller. Swales also double as landscaping features, increasing the value and attractiveness of the site, as well as its appeal to neighbors and regulatory boards. Provide water quality treatment; remove suspended solids, heavy metals, trash. Infiltrate water into the ground. Provide a location for snow storage. Water quality swales are widely applicable on residential, commercial, industrial, and institutional sites. The amount of impervious cover in the contributing area to each swale should be no more than a few acres, and swales should not be used in areas where pollutant spills are likely. 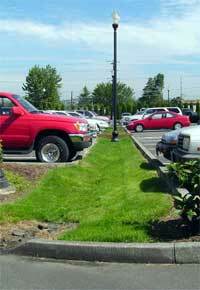 Grassed swales can be used in parking lots to break up areas of impervious cover. Roadside swales can be used in place of curb and gutter systems, except where there are numerous driveways requiring culverts. Where sidewalk and road are parallel, swale should be between the sidewalk and the road. Swales can be used on commercial sites to convey runoff around the site and to help slow peak discharge rates. Vegetated swales may be parabolic or trapezoidal in cross section. Longitudinal slopes should be as low as possible, and never more than 4%; swales should follow natural topography and drainage patterns to the extent possible. Swales work best in sandy loams that facilitate infiltration; very sandy soils may be prone to erosion under high runoff velocities. Check dams placed along the length of the swale can help to slow the runoff even more and promote greater infiltration and pollutant removal. Careful hydrologic design is necessary to ensure adequate pretreatment of the water quality volume and nonerosive conveyance of large storms. In some applications, swales are designed with a 2- to 3-foot deep soil bed of loamy sand to promote greater infiltration; on denser sites, this bed may include a perforated underdrain to ensure rapid drainage of the swale if groundwater infiltration is slow. In such applications, the runoff would end up (via the underdrain or swale termination) in the conventional stormwater system, but the swale would still provide considerable quality, quantity, and rate benefits. Swales help to control peak discharges by reducing runoff velocity, lengthening flow paths, and increasing time of concentration. Infiltration through the natural substrate helps to reduce total stormwater runoff volume. Swales provide effective pretreatment for downstream BMPs by trapping, filtering and infiltrating particulates and associated pollutants. The design rate for TSS removal is 70%. Swales accent the landscape and may help to satisfy landscaping and greenspace requirements. Swales can provide a location for snow storage during winter months. Roadside swales effectively keep stormwater flows away from street surfaces. Construction may cost less than conventional curb and gutter systems. Each grassed swale can treat a relatively small drainage area of a few acres, depending on land use and soil type. Large areas should be divided and treated using multiple swales. Swales are impractical in areas with steep topography. A thick vegetative cover is needed for these practices to function properly. Grass must not be mowed too short. Swales should be used carefully on industrial sites or areas of higher pollutant concentrations. If used, they should be part of a “treatment train” that includes other treatment BMPs. Swales can be subject to channelization, if erosive velocity is exceeded. Soil compaction can reduce infiltration capacity. Swales are not effective at reducing soluble nutrients such as phosphorous. In some places, the use of swales is restricted by law; many local municipalities may require curb and gutter systems in residential areas. Permits for water quality swales should specify schedules and responsibility for inspection and maintenance. Since swales may be located on private residential property, it is important for developers to clearly outline the maintenance requirements to property purchasers. Inspect on a semi-annual basis; additional inspections should be scheduled during the first few months to make sure that the vegetation in the swales becomes adequately established. Inspections should assess slope integrity, soil moisture, vegetative health, soil stability, compaction, erosion, ponding, and sedimentation. Mow at least once per year, but do not cut grass shorter than the design flow depth because the effectiveness of the vegetation in reducing flow velocity and pollutant removal may be reduced. Grass cuttings should be removed from the swale and composted. Remove accumulated sediment when it is 3” deep or higher than the turf, to minimize potential concentrated flows and sediment resuspension. Irrigate only as necessary to prevent vegetation from dying. The application of fertilizers and pesticides should be minimal. Reseed periodically to maintain dense turf. Remove trash or obstructions that cause standing water. Prevent off-street parking or other activities that can cause rutting or soil compaction. Vegetated swales typically cost less to construct than curbs and gutters or underground stormwater conveyance pipes. The cost of construction will depend on local conditions and management objectives. As with any stormwater management structure, property owners should provide a budget for ongoing maintenance, such as regular mowing and repairs as necessary. The topography of the site should generally allow for a longitudinal slope of no more than 4% and no less than ½%. Flatter slopes can result in ponding, while steeper slopes may result in erosion (depending on soil type, vegetation, and velocity.) Use natural topographic low points and drainageways to minimize excavation. Underlying soils should be a sandy loam or a similar soil type with no more than 20% clay. Soil augmentation may be necessary. Side slopes should be 3:1 or flatter for maintenance and to prevent side slope erosion. Swale bottoms should generally be between 2 and 8 feet in width. Use pea gravel diaphragms for lateral inflows. Check dams can be utilized to establish multiple cells. Check dams at 50-foot intervals (<2’ drop) help to maximize retention time, increase infiltration, promote particulate settling, and decrease flow velocities. Check dams are not necessary with very low longitudinal slopes. Provide for scour protection below check dam. Outlet protection must be used at any discharge point from swales to prevent scour. Select grass species that produce fine, uniform, and dense cover and that can withstand prevailing moisture conditions. Temporary erosion and sediment controls should be utilized during construction. Keep heavy equipment out of the channel during construction to minimize compaction. Even a bobcat grader can compact soils and reduce potential infiltration. Use excavator with a swing arm and work from the side of the swale. Mulch anchoring should be done immediately after seeding. The Massachusetts Stormwater and Technical Handbook (Volume 2) provides design details for vegetated swales. The handbook can be found on the MA DEP stormwater publications page, along with other useful stormwater publications.